hi,im new on conversions and i have the old or original version slide stop. i verify on the marvel website other version of slide stop http://www.marvelprecision.com/slidestop.php .the regular marvel version don't lock back the slide in the last round,this new lock back the slide on the last round?? 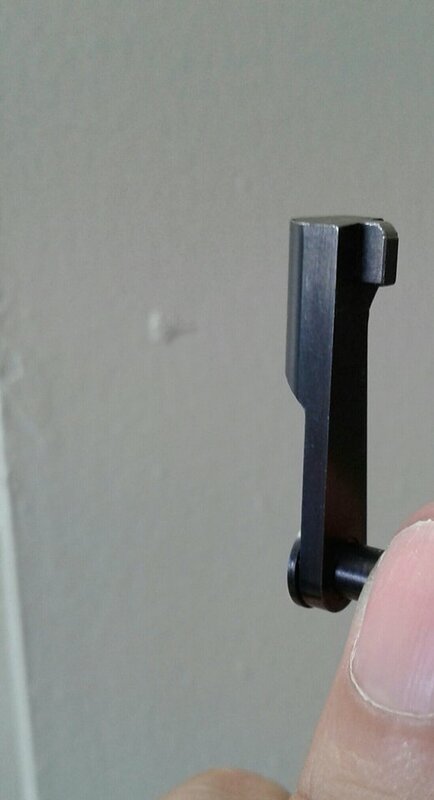 Usually, its the magazine that determines if the slide lock back is activated, not the slide stop pin. The tab on the magazine follower is removed for non-lock back use. Most all the slide stops I've seen will be activated IF the magazine has the tab in place. I'v never seen any variation on the slide stops for Marvels. If anyone has any different information, I would be interested in learning this as well. My old Marvel has a three-piece slide stop. My new Marvel has a two-piece slide stop. Both slide stops have the tab to contact the magazine follower and lock back the slide. this is my marvel slide stop. That is a two-piece unit.